I believe I've posted a few times on the utility of Facebook and the declining utility of same. Well, about a month ago, I deactivated my account and told Facebook not to bother me with their incessant "so-and-so posted this" attempts to get me back on their (dis)service. No one thing brought me to the place where I turned it off, rather, it was a long series of events. As with my on-going efforts to de-Google my life (you're reading this on the last major vestige of Google in my life), I sort of walked into it slowly and deliberately, and one Sunday afternoon, I pulled the plug. *plink* No more Facebook. There were still some things on Facebook I liked. Various ham radio pages, some WW II pages and the like all were still of interest. But the on-going deterioration of the overall experience due to the constant changes to the all-holy Facebook Algorithm, more and more intrusive ads and the steady leftist politicization of the platform all told me it was time to leave, and leave I did. You know, I don't miss it at all. I have other places to get the ham info, and while I do miss the WW II stuff (it was mostly pictures), I don't miss the constant bickering that went with the content. I guess that silence is really golden, at least to a great extent. I'm not alone. More and more people are retreating from or deleting Facebook from their lives, enough so that the hashtage #deletefacebook is trending in a minor way. I wonder if we will ever learn the lesson of the Amish? They understand that technology is a double edged sword, and that it has to be rigorously controlled lest is take control of your life. I also recall a high school reading of Thoreau, "Our life is frittered away by detail... simplify, simplify." After a lifetime spent in and with high tech, I doubt I will ever be able to renounce it all, but I find myself more and more willing to give up parts of it nearly without argument. As a father who will very soon face an empty nest, the urge to clean house, to rid myself of possessions held tightly for years, many of them of decreasing utility to an aging man, is growing in strength. I think this is simply the natural progression of someone who is unarguably in the autumn of their life. Luckily for me I've always loved autumn, with it's bright days, crisp temperatures, the changing colors of the trees, high school and college football and wood smoke in the air. There's still time for a little more fishing, some afternoons at the range and now, again, cycling. Camping takes on an extra level of pleasure as well. But it's also time for putting the yard and garden to bed for winter, ensuring the house is ready for the cold rains and snow, that wood is split and the chimney is swept. For us humans who have to face our age, it's a time to do those same things in our lives. We update family trusts and wills, check over powers of attorney, ensure that the "Do Not Resuscitate" order is is findable and unfortunately start attending the funerals of friends who are departing early. Still, if the actuarial tables can be trusted, most of us have many years left in which we can find things of interest and joy. Like others, I'm just going to look for them in places other than Facebook. This little jewel popped up on one of the last social media sites I still frequent. 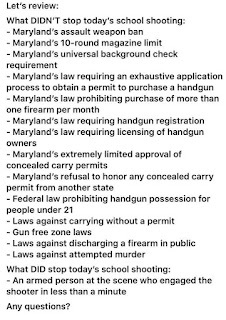 Take a look at that long list of laws, most of them relating to firearms, all of which were passed by politicians who assured us that each and every one of them was "A good first step" or "Another step to reign in gun violence" or that we had to "Think of the Children!" or some other phrase meant to appeal to those who emote rather than think. You know, I'd like to take all those politicians and their allies in all the gun grabber groups, stand them en masse up against a wall and...slather them in the blood of all the victims they have created. After all, they enjoy dancing in the blood of those victims--why not give them a full treatment. My built-in nasty streak aside, this little graphic once again points out something that our side has been saying for years. You stop a bad guy with a gun by having a good guy with a gun close at hand. This doesn't mean no one will get hurt or killed. The good guy will always be, unfortunately, behind the curve. The bad guy will always control the where and when of a mass shooting. We have to wait for the balloon to go up and then react to the situation. 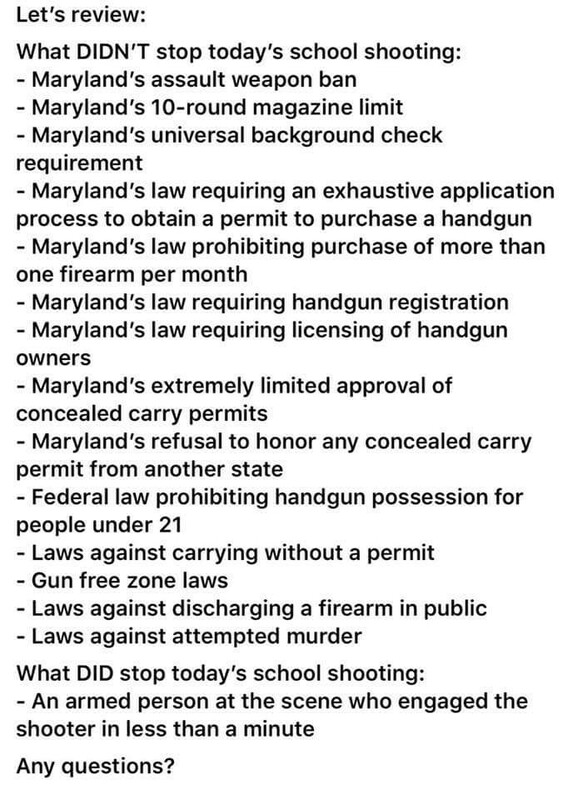 But when you have an armed person on hand, whether they are, as in this case, a police officer, or they're just your average citizen who has decided to take personal responsibility and act as their own first responder, quick reaction in a mass shooting event saves lives. No amount of angry teenagers on TV will change that fact. The Raleigh, NC PD is requesting information from Google on all mobile phones in the area of crime scenes. East Germany would be proud, I'm sure.